There are only preferences and opinions. I used to be the type of person that listened to everyone’s opinions. I didn’t know what I wanted from my life or my art, so I would ask for advice from those around me expecting them to have the answers. I made the mistake too many times of seeking counsel from people who were nothing like me. It was a terrible idea and a great way to make myself even more confused about what I should do. Eventually, I learned to trust my gut. By getting annoyed and frustrated with the advice I was receiving that just felt wrong, I figured out that I actually knew deep down what my direction was. I had to learn to ignore and even break that rules that others put before me. How many times have you heard things like this? And the list goes on and on. Some people mean well when giving advice, and some people are just opinionated and are living by a set of arbitrary rules that keep them limited and boxed up. Well, I am here to say: F*$& the rules. They only exist if you want them to. Do you want to make pretty oil paintings of flowers with ornate gold leaf frames? Do it! Do you want to paint portraits of famous people? Do you want to express yourself with color through abstract work? Do you want to explore geometry and create precise mathematical masterpieces? Do you want to make resin casts of bird bones? Do you want to create conceptual commentary on the state of the world? Do you just want to have fun and splatter paint on cardboard? Do it all. Do whatever you want. Go to art school. Don’t go to art school. Use cheap supplies. Use professional quality supplies. Paint on canvas. Paint on rocks. Paint with whatever substance you can find. Follow your gut, your intuition, your muse or whatever. 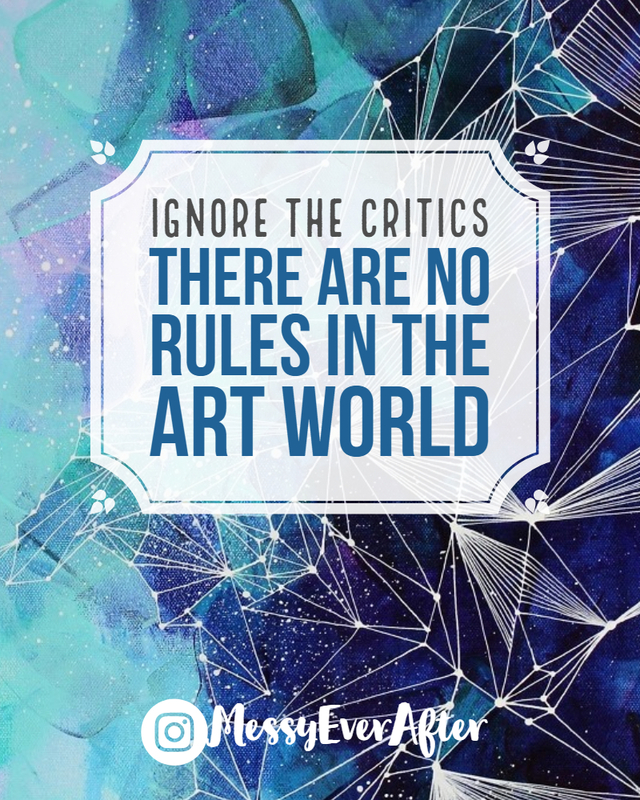 Make the art you want to make. You’ll encounter a lot of people that want to tell you what to do. Some people wholeheartedly believe in the rules. I tend to want to break those rules. Recently, I stopped by a frame shop to check out the art displayed in their front gallery and I struck up a conversation with the owner. I made the mistake of sharing that, for my own art, I like to paint the sides of my canvases instead or framing them, because I like a nice clean edge. Do your thing. Do it with intention. Do it proudly. You don’t have to listen to what other people say. Culture will always follow fads. There will always be trendsetters that make us question what art really is. Those people are the rule breakers. There will always be elitist people who stick their noses up at what was once considered ‘fine art’, because it doesn’t fit the current theme of the art world. Those people are the new rule followers. Be a rule breaker or a follower. I don’t care. Art is whatever you want it to be. That’s the beauty of it. Now that I told you there are no rules, I’m going to give you my list of rules for being an artist in a community. You don’t have to follow them, but they treat me pretty well. Don’t declare your artistic preferences as superior over others. They are your preferences. They are not universal facts. Don’t tell another creator how to make their art if they are operating contrary to your preferences. Do you want all artists to make things like you? That’s dumb. You should encourage diversity. Don’t try to invalidate the work of another artist just because you don’t see the value in it. Don’t let your ego dictate how you see another artist’s work. Make art whenever and however you can. Now go get messy and break all the rules if you want to. Are You a “Real” Artist?